35% Off Entire Yes To Purchase = $12.99 3-Step Acne Bundle, Regularly $34.97! If you use the links in this post, you can take 35% off your entire Yes To order! 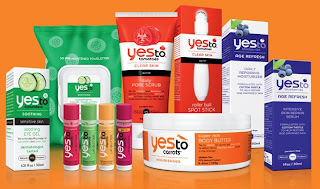 Yes To is a popular all-natural and cruelty-free company that carries skin, hair, lip, and baby products. You can use this discount to get an awesome deal on their 3-Step Acne Regimen Bundle. It regularly costs $34.97 but is discounted to $19.99. With the 35% off, it drops the price down to only $12.99! Of course, you can use the discount on anything else you want. I suggest checking out the "Online Exclusives" section to find a bunch of discounted bundle deals (including the one above) like the "Mom-on-the-Go Bundle and Perfectly Pampered Bundle. Shipping isn't included and depends on how many items you order. For example, the bundle described above added $6 shipping. I added another bundle and it became $8. However, if you spend $40 or more, your shipping will be free. So with a $40 order, you'll spend $26 with the discount and free shipping...not bad!